European Central Bank (ECB). Source: Wikimedia Commons. In the last two weeks, consensus estimates of earnings per share have been revised down 32% in the Eurostoxx 50 index and 13% in the Stoxx 600 index, according to Bloomberg. Germany’s industrial production fell 0.1% in January, compared to a consensus estimate of a 0.5% rise. In France, January Industrial Production fell by 2% and in Spain by 2.6%, both well below expectations, which pointed to a flat growth in both cases. The Economic Surprise Index published by Citigroup plummeted in the eurozone, while it fell more moderately for the US. 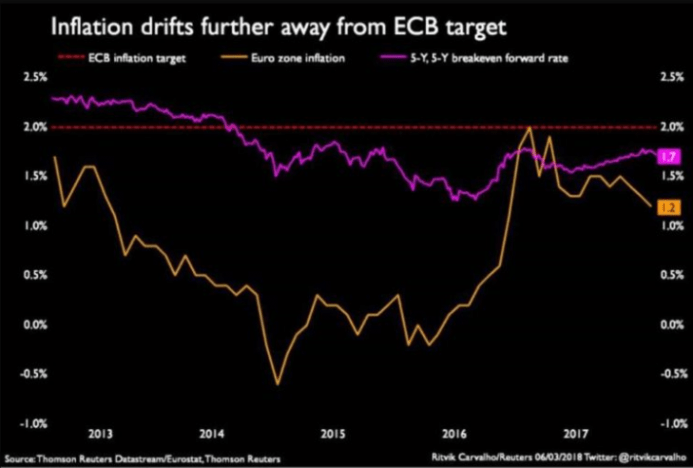 The European Central Bank has revised downward its inflation estimates a tenth to 1.4% for 2018 while maintaining the 2019 estimate, as they always do, until they have to face the reality. These data for Europe can be partly explained by a beginning of the year with milder temperatures, which have led to energy production falling more than expected — 7.5% in Spain — and, to a certain extent, due to a lower activity in construction. But none of those seasonal factors explain the huge decline in corporate earnings estimates and economic surprise. While forecasts of earnings per share growth remain close to +4.5%, it is evident that we are far from the euphoric prospects seen six months ago. And we are only three months into the year. Slowing growth in Europe should not be a surprise. Economic data since October already showed a peak and gradual slowdown in growth. It has been evident in China and Japan as well. Japan, the poster boy of Keynesian stimuli, showed us the harsh reality again. Central banks do not print growth. Japan grew by only 0.3% in the quarter and remained at a mere 1.2% annualized despite multiplying money supply and a monthly $70 billion stimulus. Let us face it. Europe — like Japan — is growing as much as it can. The enormous burden of excessive government spending, high taxation and overcapacity adds to the disinflationary trends of aging of population and technology. The risk for Europe is that it has once again bet its entire recovery on monetary policy, as it did in 2009. And, of course, when the central bank injects almost two trillion euros into the economy, you get some growth, but debt continues to grow and productivity suffers. Productivity growth in Europe is practically stagnant. One of the reasons is the decline in capital intensity because the growth of gross investment is still very poor. This is to be expected. With the excuse of employment, investment in low productivity sectors is encouraged through subsidies, while high productivity sectors are fiscally penalized and overcapacity is perpetuated by keeping zombie companies alive. As the BIS alerts, the number of zombie companies has skyrocketed. The eurozone keeps a certain tailwind thanks to low oil prices and low-interest rates, but it is worrisome to see that the reform impulse has disappeared in almost all countries and that, again, many think that money is free and liquidity is guaranteed. The biggest concern is complacency. Indeed, some of these data will bounce back, but the abandonment of reforms and maintaining bureaucratic interventionism while the governments congratulate themselves for exports that do not depend on them, is more than dangerous. Indeed, the eurozone has achieved an enviable trade surplus, but it is not thanks to its political apparatus. The eurozone has emerged from the crisis because it avoided the three most dangerous words in an economy, stimulating domestic demand. The three words that have led the European economies from crisis to crisis before and after the euro. There is an additional worrisome component. The slowdown happens in a period in which interest rates are zero, deficit spending is the norm in 90% of the eurozone countries, and the ECB continues to buy €30 billion in assets monthly. Pay attention to these risks. Even if there are seasonal effects, Europe shows some important weaknesses and recognizing it is important. Reforms must be recovered so that the end of the placebo effect of monetary stimuli does not result in a new and greater crisis. * Daniel Lacalle has a doctorate in Economics and is the author of Escape from the Central Bank Trap, Life In The Financial Markets and The Energy World Is Flat.